Bambu is the ultimate party destination with a reputation as a thriving hub of activity. Bambu offers fun for 18 to 50+ .It’s Latin / Tiki interior creates an instant feel good atmosphere and our delicious fresh fruit cocktails served in our stylish TIkitastic Mugs. Party groups will be blown away with our sharing cocktails served up in our unique drinking vessels, try the perfect storm and our Dead mans treasure chest which are great for groups of 10+ However, the fun doesn’t end there, after a little visit to our Rum Shack the home of our showcase Cocktails, head to our Karaoke pods and party the night away to the latest number ones and don’t forget the golden oldies. 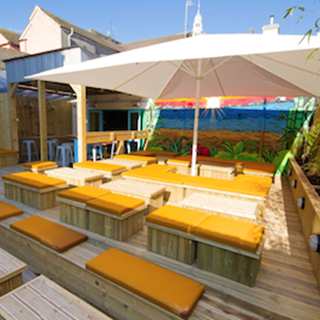 Enter on to our Terrace and chill out in the surroundings of the hand graffiti walls in a contemporary beach theme. 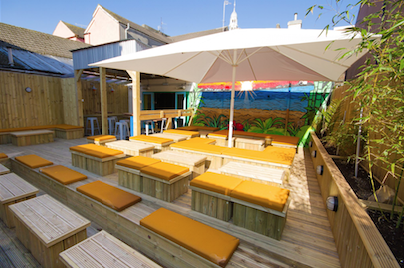 Our exclusive roof top terrace sweeps you away to your own island of rum and rhythms, we even give you the chance to dip your feet in to the sand. 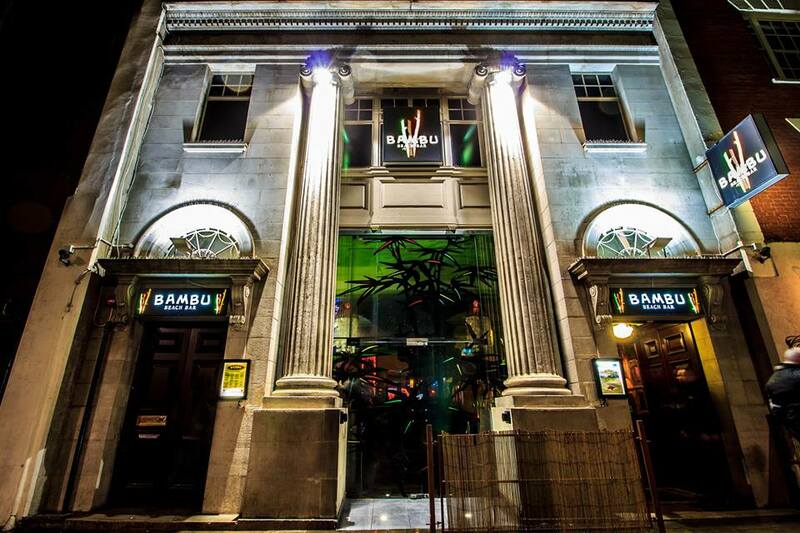 Bambu offers a mix of live music from livebands, latin nights and all presented by our expert DJ’s on each night, there is something for everyone in this city centre’s little bit of sunshine. Emily couldn’t be any more helpful if she tried. She was checking in on us offering us more drinks if needed. Very friendly. We come there for booth every Easter Saturday as a works night out because we in retail and shut Easter Sunday. This one was the best service. Thank you again. I recently came to bambu and I thoroughly enjoyed my experience. I won a competition online. Service was brilliant and amazing price from the competition I won for my birthday the girl that served us was great, she made us feel welcome. I’ll definitely will come back. Bambu is my absolute go to for a night out in Swansea. It’s got the music, the drinks, the atmosphere and the best staff about! I’ve won a few prizes there and they’ve always given me a good night! Always a great night at Bambu! Absolutely disgraceful. Booked a karaoke booth for a work colleague' 50th part as a surprise. Turned up only to be told karaoke wasn't working. I'd has an email 29 minutes prior to our booking but hasn't seen this. Would only refund in cash when the payment was made via card. Tried to offer us a booking for 12 even though the bookings were only pushed on for an hour. Unfortunately we couldn't make that time as we'd all caught the train. So disappointing that we then had no surprise planned. Will not even try to book again. Nothing was too much trouble for the staff. There were 20 of us. The staff were friendly and helpful all day. We had  the cocktail making class followed by food then 2 hours karaoke. We did enjoy our visit, though unfortunately the power cut to the room several times, meaning that staff had to come in to reset the karaoke system. Also, staff did not come to the room to offer us drinks as promised. For £60 I don't think this is value for money. Lovely cocktails!! Great music and atmosphere on the terrace! Amazing night for my friends birthday thank you. Always go to bambu first!! Excellent setting for our Christmas party was a brilliant night and the staff were excellent. Fabulous host, didn’t quiet catch her name! Always checking to see if we needed anything, service was spot on by all staff! Had a fab night by all! The karaoke booth was great but it was very much - here’s your booth, sort yourself out. Nobody offered drinks during our 2 hour booking and the booth wasn’t ready when we arrived. One of the mics weren’t working and it took us 20mins to get anybody to fix it. Booked a Karaoke booth for 11pm. We arrived at 5 to 11 but were made to wait at the bar until 11.25 until we were able to enter the booth. Whilst waiting to go to the booth we went to sit down at an empty set of seats when a drunk, sweaty bloke ran over and began shouting at my boyfriend, threatening to hit him if he didn't move. He stood up and explained he didn't realise they were taken ( no one was sat there, there was no reserved sign, no jackets on seats.) Next thing we know, a woman walked over, grabbed his arm and told him her brother owned the club and she could do what she liked- charming! If it wasn't for having pre-booked the booth I'd have left at this point. When we finally got to the karaoke booth, the microphone wires kept falling out of the wall and were very temperamental. We began ordering drinks but we told the dead man's chest was unavailable- a shame as this was supposed to be a special event. We then ordered 5 jugs of cocktails as an alternative. They took 30 minutes for the first to arrive and another 20 minutes before the final jug arrived- so 50 minutes in total. 4 of the 5 jugs were completely wrong- most of them contained nothing but soda water and spirits. Whoever was making them forgot all juices. We also ordered 2 volcano cocktails and only 1 ever appeared. It was completely shambolic and a horrendous start to a birthday night out. The bar manager agreed not to charge us, which we appreciated but unfortunately we had already wasted half of our night, with 1 jug of cocktails between 9 people and £60 down on the booth. Luckily we left, went to Elixir across the road who sorted us with gorgeous 241 cocktails and had a great night. Some serious training in cocktail making, hosting and some upkeep on the booths desperately needed- and maybe have a word with overbearing family members who appear to think they own the joint and pushing paying customers away. Disappointed with the booth and the drink. Booth is out of the way of everything and the drink seemed to be the one you can’t sell and we didn’t receive the tiki bombs like you said we would. Although we had a good time, service was very slow, we were booked in for karaoke at 9.30 & we didn’t start until gone 10.00, due to sorting out one of booths that didn’t work, surely that should of been checked before we came. Also we had table service yet it was at least 45 mins til someone took our first order, then I waited over 20 mins for my first drink. Had a great evening at bamboo, Ross was great and nothing was too much trouble. My only concern was the food was very undercooked and the staff were complaining about this and there was only one person serving on the bar so the service was slow. We booked a Karaoke Booth for a hen party. The staff were amazing and ensured we had plenty of drinks! There were a few issues but the manager at the time, I think Dylan ensured it was resolved smoothly and swiftly. Didn’t receive half of the drinks we ordered and paid for in drinks package and were made to wait nearly 2 hours for 1 cocktail sharer. Terrible service, would not recommend or visit again.